How much is that doggy in the pet store suffering? Pet store puppies are kept in isolation in tiny steel cages with cruel metal-grated bottoms in many pet stores in the Lower Mainland of B.C. Join AAS in the fight to get this cruelty stopped - scroll down or click here to read our proposed standards (based on the District of North Vancouver bylaw). 4 months in a cage that's barely larger than he is; only let out by kind employees when the boss isn't around. The metal grating is painful to sit, stand, or lie on, and blankets aren't allowed, so like all the puppies, he barely moves. He must be so sad and lonely. How long has she lain here, with no stimulation, no loving hands, no blanket for comfort? Perhaps if her price weren't so high, she would not have to grow up in a cage that's barely bigger than she is, with only a cold, hard metal grate for a bed. Dogs are the most gregarious of all nature's creatures, never leaving their family circle. She was taken from the protection and love and comfort of her mother and her siblings when much too young, to be nothing more than profitable merchandise. She was like this for the whole 20 minutes we were in this pet store. She's only a few weeks old, but she's already depressed. We were told by a store clerk that the breeder was a CKC member. CKC members are not supposed to sell to pet stores. 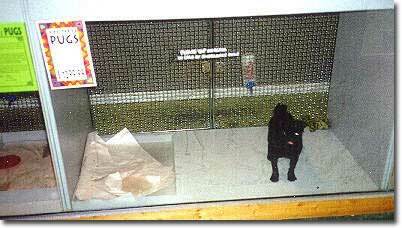 This little pug was the worst case of "kennel crazy" we have seen; and no wonder - it had been in that cage for two months, since it was 8 weeks old. Animal Advocates went back to the store to buy the pup because we couldn't bear to think of its misery, but it had been returned to the breeder (like damaged goods) because it was hermaphroditic. We asked the store's owner to contact the breeder to say we would pay full price for the pup even though we knew that it would almost certainly be dead. 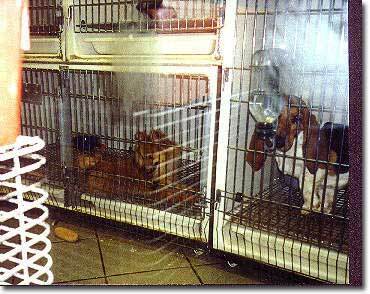 When there's no market, and no breeding possibility for a pup, many breeders kill them. We never heard back. This poor Pom was also "kennel crazy" and didn't stop twirling long enough to get a good picture. 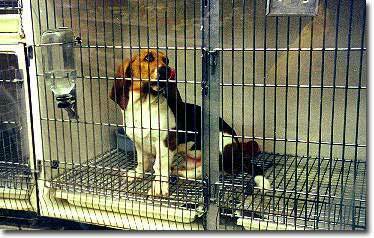 He'd been many months in his cage, only allowed out occasionally in the narrow space between cages. It must have hurt terribly to run on the metal grating, but he couldn't stop himself; we saw his paws get caught and he had to wrench them out. 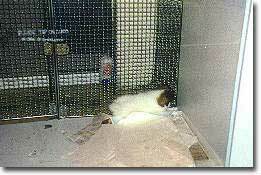 This cruel isolation and confinement is psychologically scarring, and can cause behaviour problems that result in the dog's death by euthanasia when it becomes an adult "problem dog". 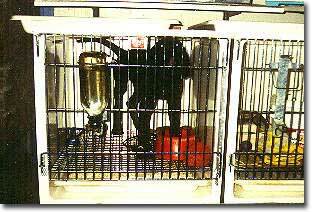 This pup grew up for 6 months in this cage.. To get his tender feet off the terrible metal grating, he stood with his feet in his bowls. His head was perpetually bowed. Even though his price kept being reduced, no one would buy him, but after complaints were made, he disappeared. 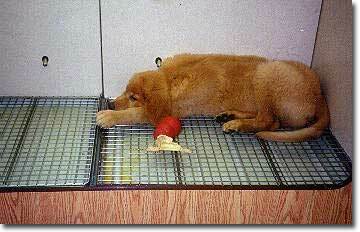 After the District of North Vancouver adopted "Pet Store Regulations", this store stopped selling dogs.